Whether you're new to sword collecting or a seasoned aficionado, you will instantly appreciate the beauty and heritage of this classically inspired Samurai katana sword featuring a hefty stainless steel blade. 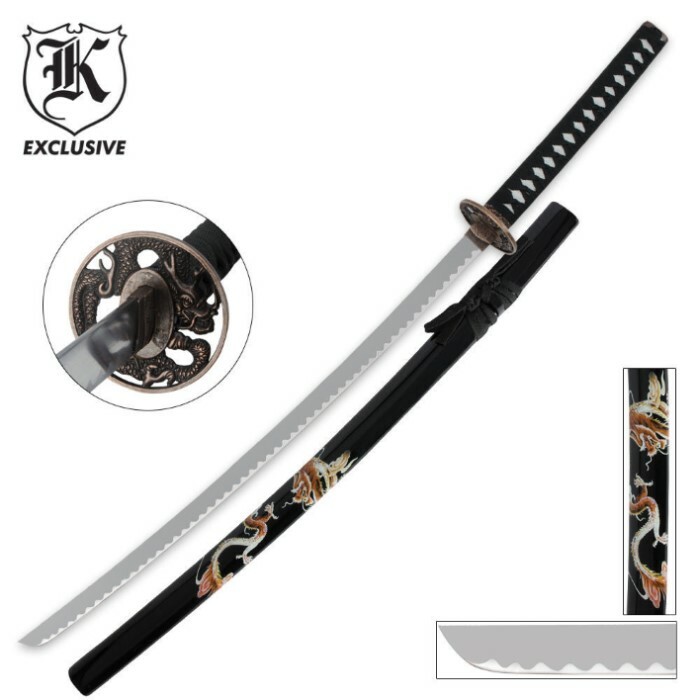 The forging patterns on the blade give it tons of authenticity, further emphasized by the faux ray skin and cord-wrapped handle, cast zinc alloy tsuba and decorative habaki blade sleeve. The antique-finished embellishments are the perfect complement to the imperial dragon theme of the tsuba and hand-painted scabbard. 27" blade; 40" overall. I got this sword, and within 3 days it started rusting and oxidizing. I have not let it touch any water. A good display sword, but that's about it. this katana is a great display item and is a good conversation starter. but this item is only for display and I wouldn't actually use it. I wasn't sure what to expect with this sword as there isn't much information in the description. Upon receiving it I learned that no, it is not sharp at all. This isn't an accident or poor quality control, it's just made with a false edge. I decided to sharpen it (which took a long time), but I wouldn't use it to cut much more than cardboard. I can't easily tell if it's full tang and I'm not going to tear it apart to see, but I would assume it's not. That being said, for $20 it is a nice display piece but not much else. I know nothing about swords, but I can tell you this thing is flat out gorgeous for the price. I am impressed! A gift for my son and he will be drooling all over it. A very nice appearance. However, I wouldn't use it to cut anything hard. A nice display sword. A very good value! What a greart show Katana !